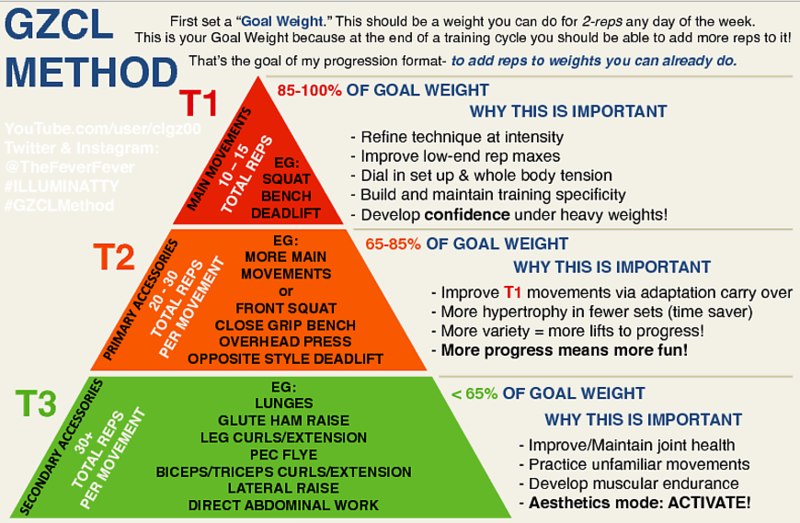 As GZCL is more of a framework than a strict program, there are many ways to adapt GZCL principles to existing training and find a version that fits your needs. Still, many folks (including GZCL himself) have taken the time to create great spreadsheets worth trying out – including many that will calculate the weight required for the major lifts. If you find any of this useful, please consider donating to GZCL. Jacked and Tan 2.0 is available in the GZCL Method Free Compendium immediately below. The key difference between the November 2016 compendium (updated November 28th, 2016) and the July 2016 compendium is the Extended Deadlift Wave Formulas and Volume Dependent Intensity Progression (VDIP) updates. The Extended Deadlift Wave Formulas provide a much more robust set of recommendations for programming around deadlift weak points (e.g. breaking off the floor or locking out). The VPID update focuses high effort sets across a variety of rep ranges to allow for linear-ish progression. This is a great starting point if you’re trying out GZCL for the first time, as this one workbook contains many different GZCL flavors to try. November 28, 2016 update notes, focusing on Volume Dependent Intensity Progression (VPID) theory. November 2016 release notes focusing mainly on the extended deadlift wave formulas. July 2016 release notes focusing on the rest of the program. This is similar to the UHF program included in the GZCL free compendium, but it includes a heavy single in each training session (inspired by to RTS programming methods). For Max Rep and AMRAP sets, leave 1-2 reps in the tank. Created by /u/flannel_smoothie, “Jacked and Flan” is a hybrid of Jim Wendler’s 5/3/1 and GZCL’s Jacked and Tan, allowing the user a bit more control over volume. Includes lots of great volume and progress tracking as well! See the full GZCLP spreadsheet post for more variations. An interpretation of the infamous original Jacked and Tan program by Redditor /u/JosephusBroz. This is a variation of Jacked and Tan that focuses on upper body hypertrophy. Squats are programmed 3x weekly and bench press is programmed 2x weekly. Deadlifts are not programmed in this GZCL variation. More details on this program are available here. This is useful if you’re looking to run GZCL across two, three, four, five, or six day per week cycles. This spreadsheet, developed by Redditor /u/TheAesir , is based off of GZCL principles with some personal tweaks that worked well for this particular lifter. “Includes templates for GZCL linear progression program and a three week GZCL-style program.” Generally recommended for novice to novice/intermediate level users. s/o to /u/youngquinn for cleaning up the spreadsheets. A straightforward, no-nonsense approach to the original GZCL methods assembled by /u/durable and edited by /u/point3edu. GZCL approved! Just another spreadsheet I found. I’m missing the source, so if you’re aware of it please let me know.